Manulife’s CoverMe™ Packing App has been recognized with an Outstanding Mobile Application award in the first annual MobileWebAward Competition, produced by the Web Marketing Association. The app, designed by Delvinia and Manulife, and released in iTunes last December, is designed to help travelers with the process of planning and packing for their trips. Users can download the free app to create customized travel packing lists from categories like Important Documents, Clothing, Toiletries, and most importantly Travel Insurance. For 15 years, The Web Marketing Association has produced the annual WebAward Competition, which names the best web sites in 96 industries. For 2012, the WebAward judges chose to split out the mobile sites into a separate competition to recognize the growth and creativity in this space. The Manulife app also won two Silver Awards of Distinction in the 2012 Communicator Awards competition, including honours in the Mobile Apps—Business category and in the Mobile Apps—Travel category. 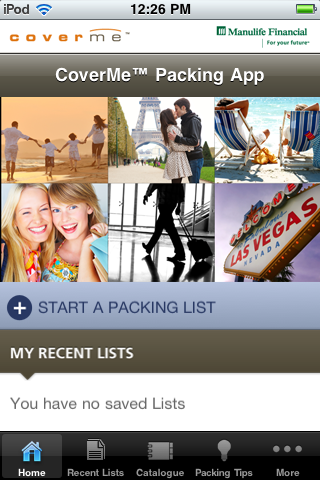 The CoverMe™ Packing App can be downloaded from the iTunes Store. To read more about our work with Manulife, please see the case study in our Work section or visit our MobileWebAward winner’s page.